We do not ship outside of the USA. Size: 7" x 8 1/2"
Adult linksters will enjoy a personal profile of a beloved golfer.The only thing safe from their golf shots are the fairways... the worms, trees, ducks, fish, and birds are in mortal danger. 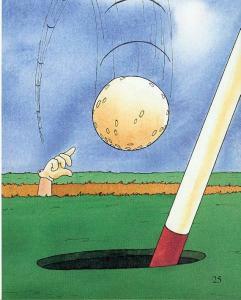 "Every time I hit the golf ball, my stress level goes down. 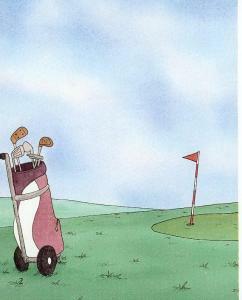 This certainly justifies why I hit so-o-o many shots" Two versions to choose from. 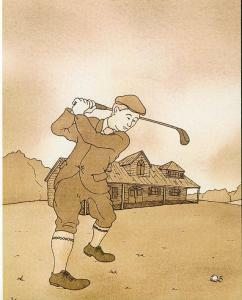 The game of golf, as we know it, was developed in Scotland in the early 1700's. Since its humble beginnings, the game has exploded in popularity around the world. From its legendary stars like Slammin' Sammy Snead to the current crop of rising young stars on the PGA and LPGA tours, the game has been played many ways. And then, there is Bobby Tolomeo's way! Bobby along with Stu, Mark, and Matthew often tee it up on their favorite golf course, Plainfield Country Club. 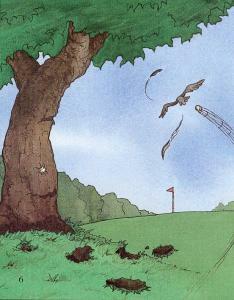 When this happens, the only thing safe from their golf shots is the middle of the fairway. 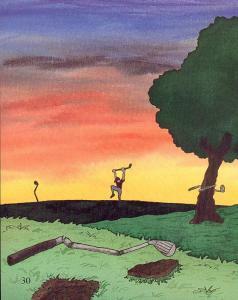 Worms, trees, ducks, fish and birds are in mortal danger!. Rumors to the contrary, Bobby is no cheapskate. The truth is, Bobby may be a bit frugal when it comes to less important issues like retirement planning, dental work and back - taxes - but not when it comes to golf equipment. Bobby learned long ago that golf is a game you play to win. After all, there's usually a wager or two at stake. Over the years, Bobby has learned to hold his breath on his backswing, play the ball where it lies, and never worry about a little water. Golf is not the most important thing in Bobby's life. He knows how to set priorities and put things into perspective. 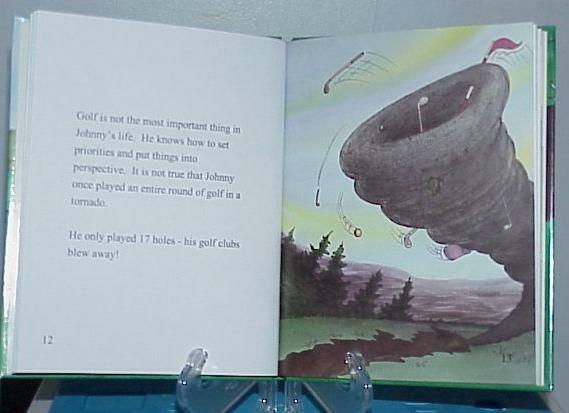 It is not true that Bobby once played an entire round of golf in a tornado. 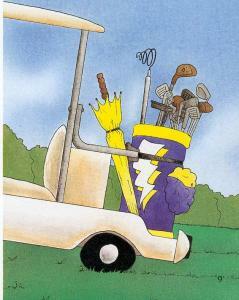 He played 17 holes - his golf clubs blew away! Every golfer dreams about a perfect round of golf. This is a game where every drive is down the middle of the fairway, every green is hit in regulation, and every putt is knocked into the center of the cup. Some golfers even aspire to the ultimate accomplishment - shooting one's age. Bobby has no trouble shooting 29. 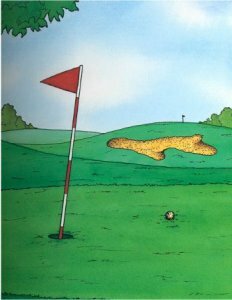 The problem is, he does it on the first few holes. 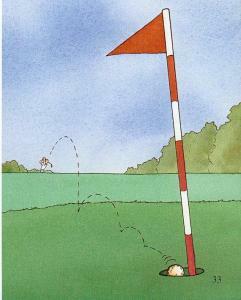 Most “good” golfers have a collection of shots for every occasion. These include a fade, a draw, a bank shot, and a bunker shot. Bobby also has a collection of golf shots including the worm burner, the skull, and the pop-fly. 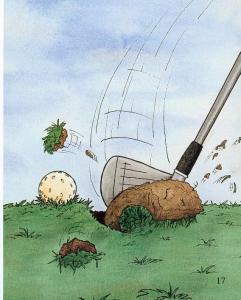 His best shot is called, “Ooops, that's a mulligan,” so named by Stu, Mark, and Matthew. 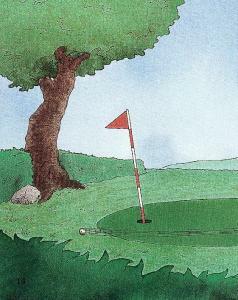 Years ago, a golf handicap system was invented. This system was designed to let golfers of different skills and abilities play against one another on an equal basis. The idea is to take the best 10 rounds of a golfer's last 20 rounds and use these to determine one's handicap. The system has one major flaw for Bobby: he has never played 10 rounds of golf worth counting. One of the reasons Bobby plays golf is for the exercise is provides. Other activities were just not right for Bobby. He tried swimming, but kept sinking to the bottom. He tried tennis, but the net kept getting in the way. Jumping to conclusions was fine, but tired him out. Golf provides exactly the right amount of exercise for a finely tuned athletic body like Bobby's. After most rounds of golf, Bobby usually joins Stu, Mark, and Matthew for a visit to the 19th hole. This provides them with a chance to rehash the shots of the day, settle the wagers, and plan their next outing. The scene is usually the same. Bobby delays in the pro shop until the drinks are bought. Then he rehashes all of his unlucky bounces, pays off his debts, and leaves just before it is his turn to buy. Despite his apparent lack of skill, Bobby still manages to hit the occasional good golf shot. There is still talk about the birdie Bobby got last year when he miraculously hit his shot out of a deep bunker right into the hole. Otherwise, why would he hit so many shot?. Despite suffering through years and years of frustration playing golf his way, Bobby has always remained a good sport. His demeanor is beyond reproach, he never loses control, and his voice is never loud enough for anyone over a mile away to hear. This, together with the fact that Bobby always pays off his losing bets, makes him the perfect partner. 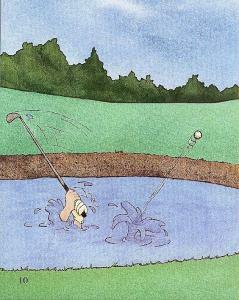 The game of golf is certainly a challenge to Bobby Tolomeo. Many friends, including Stu, Mark, and Matthew, ask why he even plays the game. The reason is simple. 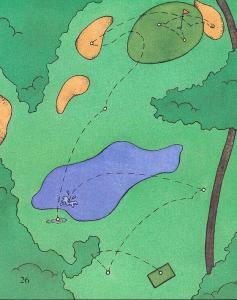 Bobby enjoys watching miraculous events such as a long putt dropping in or an iron shot finding its way into the hole. Bobby would enjoy it even more if he were the person hitting these shots. Enjoy the game as you play it. Don't let your scores ruin your day. Think of golf the same way you think about bowling: the higher the score, the better. Then, there is Tommy Smith's way! Tommy along with Jessica, Steven, and Kyle often tee it up on their favorite golf course, Greenville Country Club. 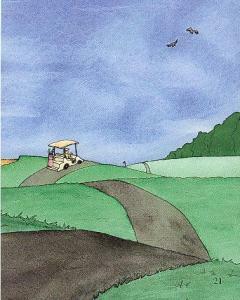 When this happens, the only thing safe from their golf shots is the middle of the fairway. Worms, trees, ducks, fish and birds are in mortal danger!. Rumors to the contrary, Tommy is no cheapskate. The truth is, Tommy may be a bit frugal when it comes to less important issues like saving for a new car, saving for college, and buying new clothes, but not when it comes to golf equipment. Tommy learned long ago that golf is a game you play to win. After all, there's usually a reputation at stake. Over the years, Tommy has learned to hold his breath on his backswing, play the ball where it lies, and never worry about a little water. Golf is not the most important thing in Tommy's life. He knows how to set priorities and put things into perspective. 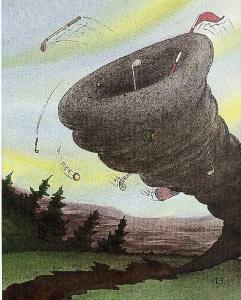 It is not true that Tommy once played an entire round of golf in a tornado. A perfect game happens when every drive is down the middle of the fairway, every green is hit in regulation, and every putt is knocked into the center of the cup. Some golfers even aspire to the ultimate accomplishment: shooting one's age. Tommy has no trouble shooting 10. 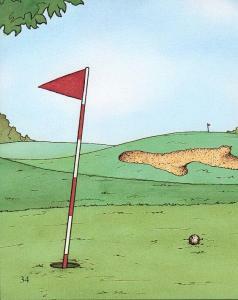 The problem is that he does it on the first two holes. Tommy also has a collection of golf shots including the worm burner, the skull, and the pop-fly. 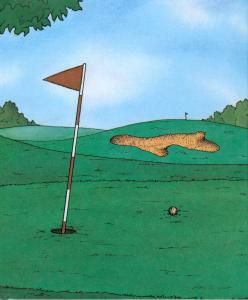 His best shot is called, “Ooops, that's a mulligan,” so named by Jessica, Steven, and Kyle. The system has one major flaw for Tommy: he has never played 10 rounds of golf worth counting. One of the reasons Tommy plays golf is for the exercise is provides. Other activities were just not right for Tommy. He tried swimming, but kept sinking to the bottom. He tried tennis, but the net kept getting in the way. Jumping to conclusions was fine, but tired him out. Golf provides exactly the right amount of exercise for a finely tuned athletic body like Tommy's. 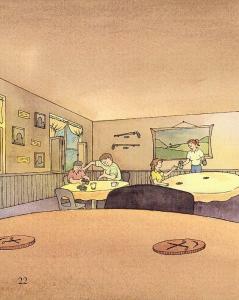 After most rounds of golf, Tommy usually joins Jessica, Steven, and Kyle for a visit to the clubhouse. This provides them with a chance to rehash the shots of the day, settle the disputes of who's best, and plan their next outing. The scene is usually the same. Tommy delays in the pro shop until the shakes and fries are bought. Then he rehashes all of his unlucky bounces, admits his blunders, and leaves just before it is his turn to buy. Despite his apparent lack of skill, Tommy still manages to hit the occasional good golf shot. There is still talk about the birdie Tommy got last year when he miraculously hit his shot out of a deep bunker right into the hole. Despite suffering through years and years of frustration playing golf his way, Tommy has always remained a good sport. His demeanor is beyond reproach, he never loses control, and his voice is never loud enough for anyone over a mile away to hear. 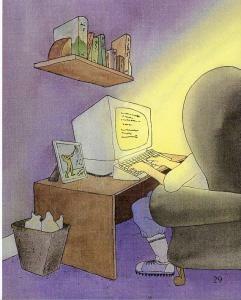 This, together with the fact that Tommy always whines quietly to himself, makes him the perfect partner. The game of golf is certainly a challenge to Tommy Smith. Many friends, including Jessica, Steven, and Kyle, ask why he even plays the game. The reason is simple. 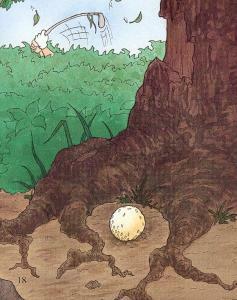 Tommy enjoys watching miraculous events such as a long putt dropping in or an iron shot finding its way into the hole. Tommy would enjoy it even more if he were the person hitting these shots.